From Machu Picchu to the streets of La Paz, join us as we journey across Peru and Bolivia into the Inca heartlands. This epic 14-day adventure will kick off in Lima, Peru’s vibrant coastal capital. We’ll encounter the foodie delights of this enchanting city, before heading into the highlands to uncover the mysteries of the Inca Empire. 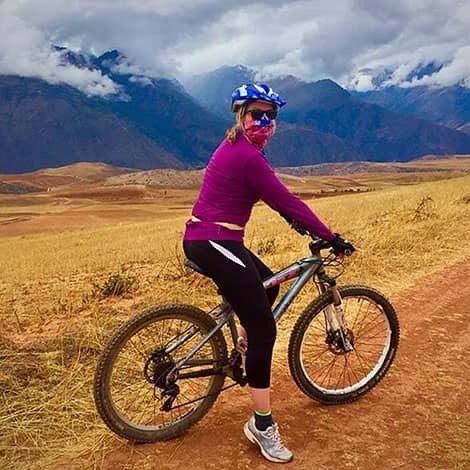 Embrace the spirit of adventure in the Sacred Valley, gliding over the slopes by mountain-bike. Then prepare for a unique bucket-list moment as we seek out the lost city of Machu Picchu. After soaking up Cusco’s urban treasures, we’re off to Lake Titicaca on the Peruvian-Bolivian border. Unwind in a landscape of profound serenity, discovering the ancient islands where the Sun God himself is said to have been born. Nothing can prepare you for the otherworldly vision of the mesmerising Salt Flats, extending into the horizon for as far as the eye can see. Brimming with epic dreamlike landscapes and Inca mysteries, this South American adventure will enthral you. This spectacular lodge perches on the edge of a plateau overlooking the world’s largest salt plain, and it’s made entirely from salt blocks. Feel the salt crunch beneath your feet in this one-of-a-kind hideaway, with roaring log fires, colorful Andean fabrics and a hot tub spa with the most incredible views. This secluded retreat is located at the wild heart of Sun Island, surrounded by Inca ruins and unspoilt nature. Feel revitalized by your stay here. After filling up on a hotel breakfast, we’ll set out on our urban adventure through Lima’s downtown. We’ll pause along the way to indulge on local flavours at a winery, where you’ll get the chance to taste some pisco alongside quaint piqueos. After this light lunch, we’ll explore Lima’s nature trails, soaking up magnificent views of the city. Then we’re off to the highlands! After touch-down in Cusco, we’ll head straight for the Sacred Valley, just in time for a delicious Andean feast. Then it’s time to unwind to life in the mountains. The evening is yours, so settle into your new surroundings and acclimatise to the high altitude. Feel the fresh air revitalise you, against the stunning panorama of the snow-capped sierra. Flashpackers, prepare yourselves – today we’ll be experiencing Machu Picchu in its full magic. Located at 2,430 metres above sea level, the lost Inca citadel looks out over the ridges of the Andes Mountains. With crumbling ruins and deep valleys, this is a truly breathtaking backdrop. We’ll be joined by an expert guide, who will be at hand to take us through the chapters of Inca history. Then it’s over to you to explore the fortress at your own leisure. Feel the fresh mountain winds whip around you as you gaze down at the valleys below, with the condors soaring overhead. After lunch, we’ll hop on a train to Ollantaytambo, before journeying back to Cusco for the evening. After an action-packed itinerary filled with hiking and mountain-biking, this is your time to unwind – you’ve earned it! Enjoy a leisurely breakfast at the hotel, take a stroll through your highland surroundings or simply kick back with a good book. After lunch, it’s time to hit the streets of Cusco. A UNESCO World Heritage Site, this imperial city was the historic capital of the Inca Empire until the Spanish Conquest in the 16th century. We’ll begin our urban voyage at the Koricancha Temple, an Inca palace built in honour of the Sun God. 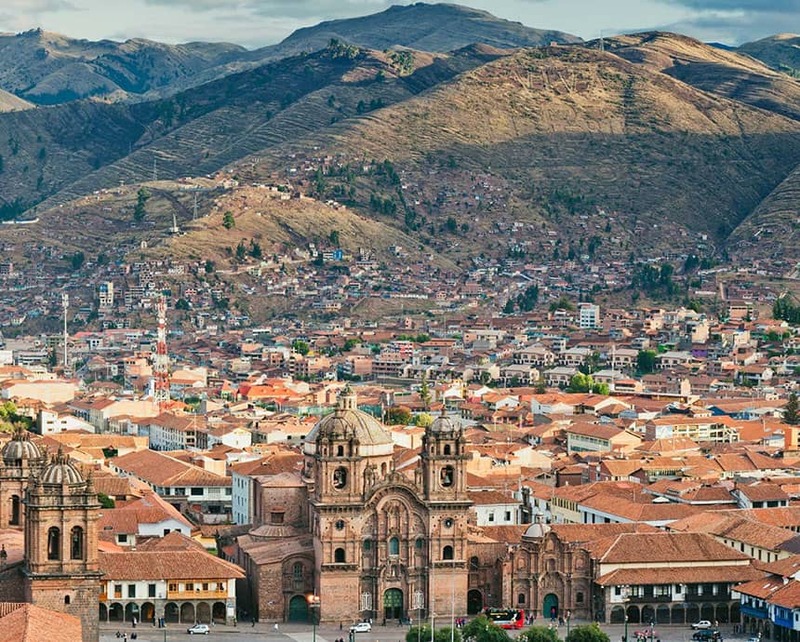 Journeying through a series of historical landmarks, from the Fortress of Sacsayhuaman to the deeply spiritual Qenqo Temple, we’ll absorb the rich cultural traditions of Cusco as twilight settles in. Foodies, listen up. Today we’ll be delving into the gastronomic traditions of the Andes, as we explore the vibrant possibilities that San Pedro Market has to offer. Feast your eyes on the rich abundance of local produce, from bursting fruit to hard cheeses, and lose yourself in the a maze of beautiful traditional textiles. After learning about the foodie products, turn your hand to transforming them into Peruvian specialities under the guidance of a professional local chef. You’ll also learn how to craft the perfect Pisco Sour – salud! After lunch, the afternoon is yours. Wander through the sepia streets and absorb the epic atmosphere of this highlands city. Or if culture is your thing, explore the city’s galleries and museums at leisure, absorbing Cusco’s vibrant artistic heritage and unique cultural identity. This morning, we’ll be moving onto our next destination – a good playlist or pack of cards will be indispensable for the long road ahead. But not until we’ve uncovered the cultural treasures around Cusco. We’ll stop by San Pedro Apostol de Andahuaylillas, a gorgeous chapel with white-washed exteriors, glowing with intricate gilded features on the inside. We’ll also pass the crumbling walls of Raqch’i, an Inca temple that has been converted into an archaeological site. We’ll tuck into lunch at a local restaurant, fuelling up for the journey ahead. Then, we’ll continue our long journey toward the Bolivian border, touching down in the southeastern Peruvian city of Puno for one night. Located at the edge of Lake Titicaca, soak up mesmerising views of the vast blue waters bordered by mountains. After checking into your hotel, the evening is yours, so settle into your new environs and unwind to the rhythm of life at the water’s edge. This morning, we’re off to an early start, heading across the Bolivian border to the lakeside town of Copacabana. After tucking into local specialities at a restaurant in town, we’ll hop on a boat and sail across the deep serene waters to the Sun Island. Absorb the rugged terrain of the island: think rocky hills and cracked earth threaded with eucalyptus trees. Soak up the breathtaking sight of snow-capped mountains on the horizon, as you acclimatize to this epic terrain. The Sun Island is home to many ancient landmarks and ruins, playing a leading role in Inca religion and mythology. In fact, it was believed that Inti – the Sun God – himself was born here. Settle into this legendary landscape and feel its hidden power, against the ebbing waters of Lake Titicaca. And don’t miss the spellbinding vision of the sunset illuminating the Cordillera Real mountains. Then unwind for the night in a unique ecolodge, nestled in the heart of tranquillity. Wake up early to catch a mesmerising sunrise, as day breaks over Lake Titicaca – while this is entirely optional, you won’t want to miss it. After breakfast at the ecolodge, we’ll traverse through this sacred island, making our way to the ancient Inca Steps. This stone stairway snakes uphill from the shores of the island, with 200 steps leading up to the village of Yumani. There, you’ll find a sacred fountain that is believed to hold the key to everlasting youth. We’ll then make our way to Chinkana, an eerie village of Inca ruins on the north of the island. 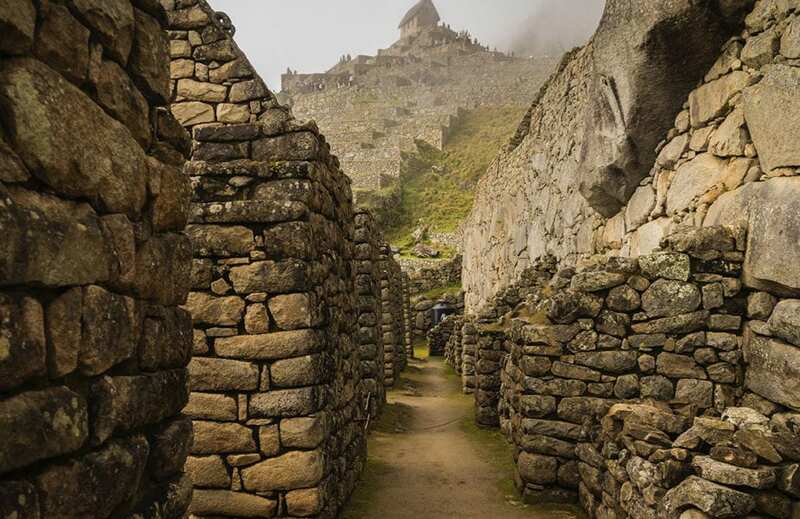 ‘Chinkana’ is the Quechua word for ‘labyrinth’ – lose yourself in its ghostly pathways and crumbling walls. If that weren’t enough for Inca heritage, we’ll then head on to the Island of the Moon, where we’ll pause for lunch. According to mythology, this is where Viracocha – the creator god in the Inca pantheon – commanded the rising of the moon. Remote and secluded, this haven of tranquillity is brimming with ancient mysteries waiting to be unearthed. Come afternoon, we’ll journey onward to La Paz. The afternoon is yours to unwind and absorb your new surroundings. Welcome to one of the world’s most high-altitude capitals! This morning, we’ll hit downtown La Paz to soak up the sights of this sprawling mountain city. From the church of San Francisco to Murillo Square, catch a glimpse of daily life in Bolivia’s capital. For lotions and spiritual advice, pop by the mesmerising Witches Market, where ancient Aymaran beliefs are still practised. Look out for the Aymara Indian women of La Paz – known as cholitas paceñas – in their colourful skirts, shawls and bowler hats (on the right day, you may even be able to catch them wrestling). Then we’ll make our way to the Valley of the Moon, an otherworldly landscape of jagged clay and sandstone monoliths. After an action-packed morning, spend the afternoon relaxing at the hotel or exploring La Paz. Get plenty of rest – we’ll need the energy for our early start tomorrow morning. Flashpackers, prepare for something truly epic today. We’ll catch an early flight to Uyuni, where we’ll come face to face with the largest salt flats in the world. Welcome to a breathtaking dreamlike landscape, where shimmering white plains stretch out to the horizon until land and sky become one. Bolivians once transported salt by steam train, and our first stop is at the train cemetery, where rusting engines and wagons litter the plains like gravestones. From here, we’ll pop over briefly to Colchani village and Los Ojos de Agua (the ‘Eyes of Water’), where we’ll hear an overview of modern-day salt processing and see how it’s manually extracted from the land. After a picnic lunch on the plains, we’ll make our way to Incahuasi Island, located in the heart of the salt flats. This dry rocky land mass rises from the plains in the shape of a fish, lending it the epithet Isla del Pescado. Continuing our journey through this surreal landscape, we’ll check into a hotel made entirely of salt blocks, just in time for dinner. Settle in as darkness falls over the salt flats, kicking back with drink in hand. After breakfast at the salt lodge, we’ll kick-start the morning’s activities by catching an early flight back to La Paz, before heading on to the ancient UNESCO city of Tiwanaku. Built at 4,000 metres above sea level, this was one of the highest urban settlements ever constructed. Boasting an intricate architecture based on a complex system of religious and political beliefs, this ancient city was the thriving heart of Tiwanaku culture from 400 – 900 AD. Marvel at the ingenuity of Tiwanaku urban engineering as you immerse yourself in the legacy of the pre-Inca past. We’ll head back to La Paz for the afternoon, where you have the rest of the day to spend as you please. Take a stroll through the enchanting city streets as evening sets in, savoring the character and atmosphere of this epic location before our journey comes to an end. Flashpackers, our epic South American adventure has come to an end. What a journey it’s been. 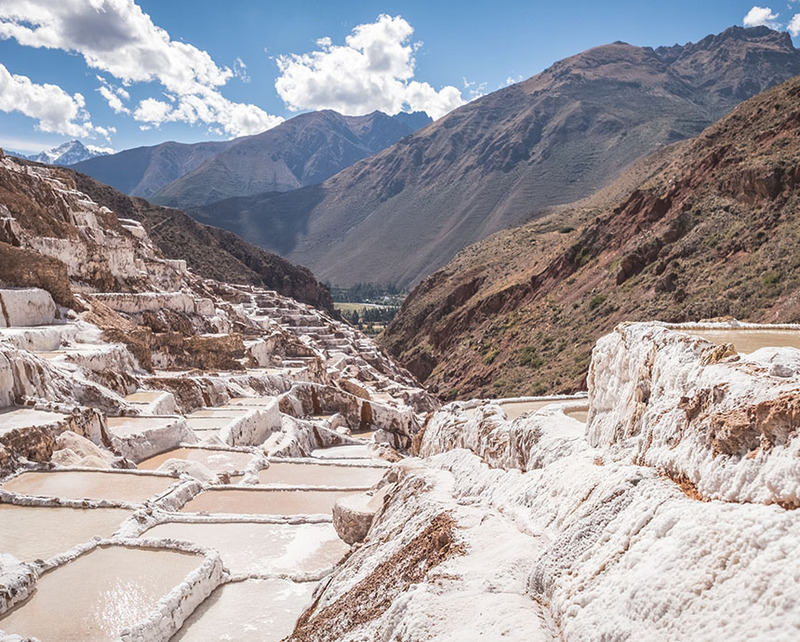 You’ve mountain-biked the slopes of the Sacred Valley, you’ve ticked off a major bucket-list moment in Machu Picchu, you’ve explored the islands of Lake Titicaca and you’ve absorbed the dreamlike panorama of the Salt Flats. But if South America has left you wanting more, why not head on to Chile? Wherever you go next, it’s been an incredible adventure. Fly into Jorge Chávez International Airport, Lima and out of El Alto International Airport, La Paz. Please try and arrive by 4pm on Day 1 (although we will pick you up no matter what time you arrive) and feel free to depart anytime on Day 14. We love Bolivia – a land of natural wonders and vibrant culture alike. However, please be aware that the infrastructure is basic. This means that traffics, delays, strikes can happen on your adventure at any time. The hotel are basic and some normal everyday luxuries such as WiFi or hot water cannot always be provided. This is a true back-to-basics adventure destination.